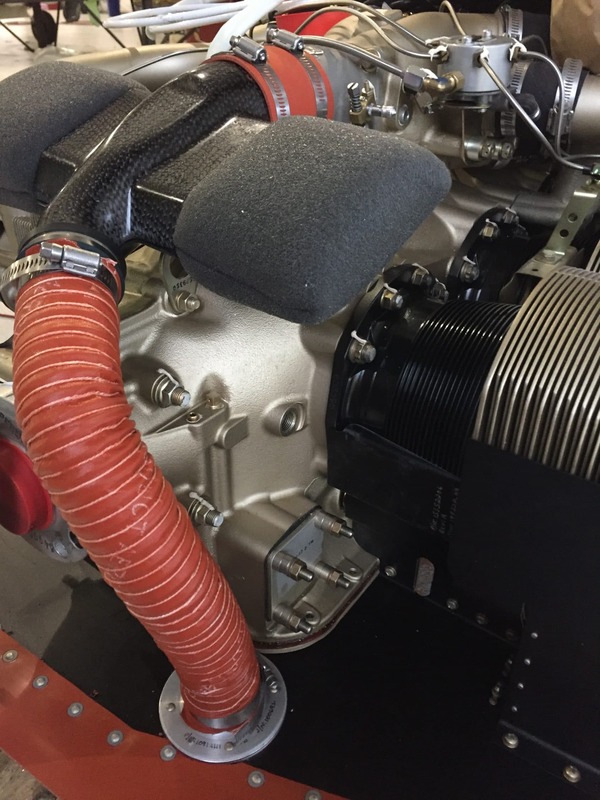 Borescope Revelation: An Oshkosh Brainstorm | Tennessee Aircraft Services, Inc. I get to attend almost the entire week at Oshkosh, known these days as Airventure. Some friends and I share a house for the week and use it to enjoy some respite from the somewhat intense activities on the Airventure grounds during the day. I walk six or more miles each day, wear a full brimmed hat, lots of sunscreen, have a few business meetings and do a few presentations for CPA in the forum pavilions. My friend, Mike Busch, who stays at the house as well, does an exhausting eleven presentations and endless meetings during the week. Blake Sides, my shop’s Aircraft Maintenance Manager, was able to attend this year for the first time, so he was doing his best to see everything possible on his first trip. One would think we’d have our fill of talking airplanes during the day and want nothing to do with them in the evenings. One would be totally wrong. We were doing the geek thing and watching a Star Trek movie after a busy day when the conversation turned to the need to have a simple way to see inside our engines. The infamous H engine used for a few years on the 172. Lifters are removable and allow some view of the camshaft. Determining the internal condition of our engines is a hot topic these days. Talk about running engines past TBO is always accompanied by methods to monitor engine condition trends. There are plenty of articles about borescoping the insides of the cylinders, oil analysis, oil filter inspections, pulling lifters and such. The ultimate objective is complete engine condition evaluation with minimally invasive methods. The “bottom end” is one area that seems to be the most difficult to access and possibly the most costly if problems aren’t identified early. Lack of access is a particularly significant problem when performing a pre-purchase evaluation on a Cessna. 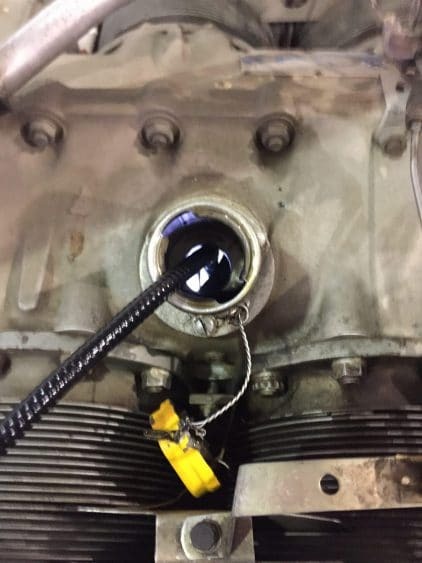 Without being able to actually see the cam, lifters, or any of the other insides, one is left with only secondary data for condition information, such as oil filter inspections, oil analysis, cylinder borescope, compressions, case pressure tests, and so on. Direct visual inspection of the inside of these engines is the pinnacle for engine core evaluation. 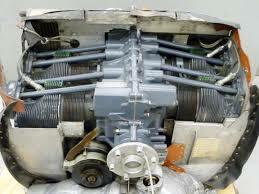 The Lycoming engines are the most difficult to access the lower end of the engine. The camshaft is mounted above the crankshaft, and the lifters can’t be removed without splitting the crankcase. The only way to see the camshaft lobes and/or the cam followers require removing a cylinder. Not exactly a low impact path to the inside of the engine. The Lycoming O-320-H2AD engines are a slight exception to this lack of internal access. The O-320-H2AD engine is installed only on the 1977 through 1980 172N. While not one of Lycoming’s best efforts, the H2AD does have camshaft lifters that can be removed for some level of internal engine inspection. Access to the cam and lifter bodies is much easier on all the Continental engines, depending on the level of invasiveness one is willing to use. The engines with the sandcast crankcase can usually be identified by the presence of an oil cooler at the right front of the engine, just forward of the #5 cylinder. Some installations and STC modifications mount the oil cooler elsewhere, so there might just be some hose fittings there. There are two relatively easy ways to view the insides of these engines. The most common is to remove the pushrods and lifters. Obviously, the lifters are very easy to inspect when removed from the engine. A good light will help to see the cam lobes through the holes in the crankcase where the lifters were mounted. Using a simple videoscope will give a really nice close-up view of each lifter, but this method requires a fairly high level of disassembly. The easiest access to a camshaft is on the sandcast engines through the oil filler port. If performing a pre-purchase evaluation, one might want to just get a sampling of the lifters and cam lobes. The most juice for the squeeze is to remove just the intake lifters from one side of the engine (whichever side is easier to access). Each intake lifter rides on a double cam lobe, so removing the one lifter allows visibility to the largest cam lobes. Still, this may be more than a seller is willing to allow. If only the absolute minimum engine disassembly is allowed then the sandcast engines offer one more very simple option. Just remove the oil filler cap on top of the engine and run a videoscope down the filler tube. A little practice and one can easily see some cam lobes and much of the wear surface and edges of several cam followers. A bonus is being able to see around the general area to include some of the crankshaft. Any rust issues should be very obvious. Even the most cantankerous seller couldn’t argue with removing the oil filler cap. A view through the oil filler port on a sandcast engine. Damaged edges on the lifters can be seen clearly. The Permold case engines can usually be identified by the presence of an alternator mounted at the right front of the engine, just forward of the #5 cylinder. Access to view the lifters and cam lobes require removing pushrods and lifters just as on the sandcast engines. Unfortunately, there’s no usable access through the oil filler port on these. Finding an acceptable way to look inside these Permold engines became the focus of our late night Oshkosh geek session. I don’t recall specifically, but I think we saw some futuristic technology on the SyFy movie we were watching that spurred our imaginations. The “what ifs” began to fly. We considered every opening into the crankcase as a possible port for access. Each presented its own challenge and internal obstacle. The more invasive the action, the higher the risk of causing more trouble than might be avoided by the inspection. A cylinder removal gives the biggest access hole for viewing, as is needed on most Lycomings, but that’s way too much work and inherent risk. Next came pulling the lifters, which is far less invasive but still removes lots of parts and has a moderate risk level. What other access holes might we find? The right front mounted alternator can be removed to open a huge hole in the crankcase. It’s a bit forward of the cam lobes, but one of these new flexible videoscopes can snake around for a look. This process would include removing the alternator and probably some engine baffling on most installations. Not a major intrusion but still more than we’d like. The next access point we considered is a small plug on the left forward side of the engine. It’s purpose is for viewing the timing marks on the large gear that also drives the alternator. There’s a lot going on in this area with the prop governor gears, alternator gear, alternator, crankshaft and the prop governor transfer collar. We surmised getting a flexible scope to weave around this obstacle course would be a challenge. The challenge, of course, couldn’t be ignored. As soon as Blake and I got back to the shop in Tennessee, pulling the timing plug on a permold engine was top on the to-do list. It took a couple of tries to navigate the flexible scope past the obstacles, but our efforts were rewarded. We were able to easily see the three front cam lobes: two exhaust lobes and the double wide intake lobe shared by cylinders #5 and #6. We could also see much of the four associated lifter faces and sides. A good visual inspection of three cam lobes and four lifters may not seem like a big deal to some. Consider that lifters usually begin pitting first, then that irregular surface damages the cam lobes. If bad lifters can be identified early enough and replaced, it could very well save the camshaft. Lifter replacement is just a day or so of labor and couple thousand in parts. 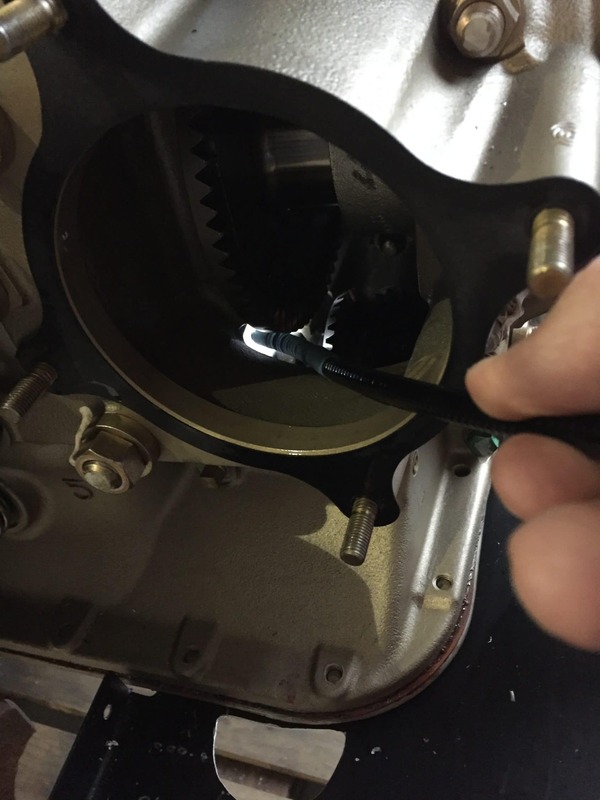 Camshaft replacement requires engine removal from the airframe and splitting the case halves. Cost for cam replacement usually starts around $14K. Knowing early is a huge difference in cost of ownership. A very good look at the front end of the cam and some lifters. 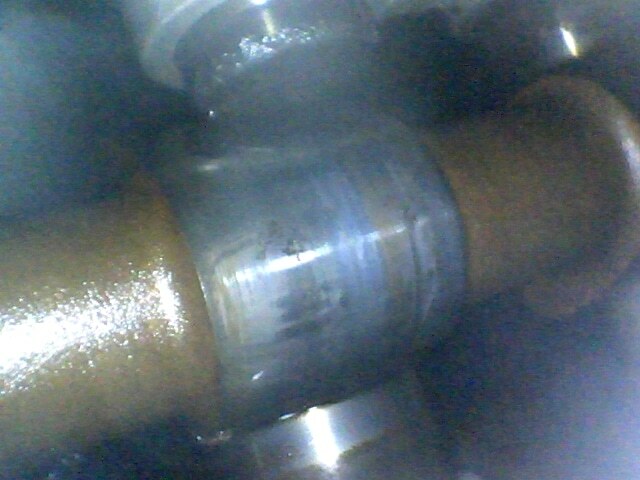 This picture taken with the borescope entering through the plug on the left forward side of the crankcase. I perform many pre-purchase evaluations every year and manage many more at shops all around the country. 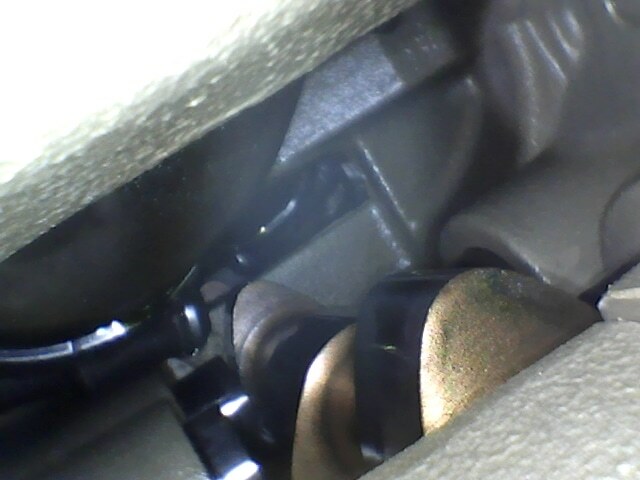 I’ve never heard of any mechanic looking through the timing port to view cam and lifters on permold engines. I know of just a handful of mechanics that have tried viewing through the oil filler tube on sandcast engines. Anyone contemplating a pre-purchase evaluation would be well served to get this easy look into an engine. Finding camshaft damage at the first annual after purchasing a plane would be disheartening to say the least. Back in the day, looking into the core of an engine wasn’t a consideration in any situation except during an overhaul. The advent of inexpensive borescopes brings critical capabilities to our industry that one is compelled to use. Whether performing a pre-purchase evaluation or routine inspection, the economic benefits of engine core condition early warning is hard to ignore.